In a shocking case, two police men damaged a scooter which was parked at the Chennai War Memorial. A video of the police personnel had gone viral on social media after which the two men were placed under suspension. The viral video was shot by a passerby, where the home guard is seen hitting the bike using a stick. The bike is parked between a barricades while a special sub-inspector (SSI) observes him from inside the patrol vehicle, who was on duty. Meanwhile, the owner of the bike surprisingly walks up to the police and drove his damaged vehicle without raising any objection. Seems like, the dome lights were broken along with the indicators and plastic body parts were also damaged. Only after the home guard notices a passerby shooting the video, he notifies the SSI about it. The SSI then asks the passerby to delete the video. According to Times of India (ToI), with the help of the footage, police identified the home guard as Mohan while the SSI has been identified as Hari Babu. Currently, a probe into the incident has been ordered. துப்புரவு தொழிலாளர் குடும்பத்தை.. நெகிழவைத்த நெட்டிசன்கள்! This page contains news relating to various facts and events. The views are generally about current affiars and general topics in diversified areas such as political, international, national, and regional issues, sports, health, travel, lifestyle, technology and business. People having similar interets on the above topics will find this page useful. 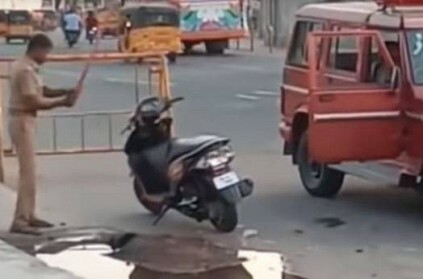 Chennai policemen caught damaging youth scooter with stick | Tamil Nadu News.